I don’t really drink stuff like this very often, but since this tea is among those that I think some of us have had, back when it was fresh off the press, I bought one for fun this time in Hong Kong to try it out. The reason I got it is not because this tea is amazing, rare, or anything — far from it. Rather, it’s because it’s been traditionally stored. People often wonder what this process does, exactly, to a tea. Here’s a good example of it. 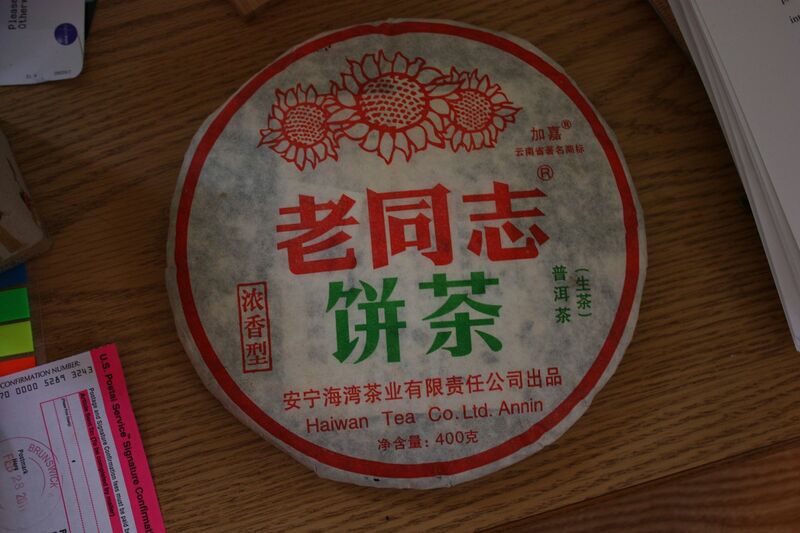 I still remember seeing this tea in Beijing when I was living there, and it sold for about $3 USD. This time, I paid close to $25 to buy it, so it felt pricey. Then again, buying tea in Hong Kong is never going to be that cheap, but if you go troll the tea markets in China, I’m sure you can still find dry stored versions of this cake selling for probably $10. Haiwan tea factory was founded and headed by Zou Bingliang, who used to be the head of the Menghai factory, and is credited with having co-invented the process to make cooked puerh. Like a lot of others who were in leadership position at Menghai, Zou struck out on his own in the late 90s and early 2000s, and I think among the slew of factories that started around that time by Menghai alum (Guoyan, 6FTM, Haiwan, etc) his outfit is probably one of the better and more successful one. 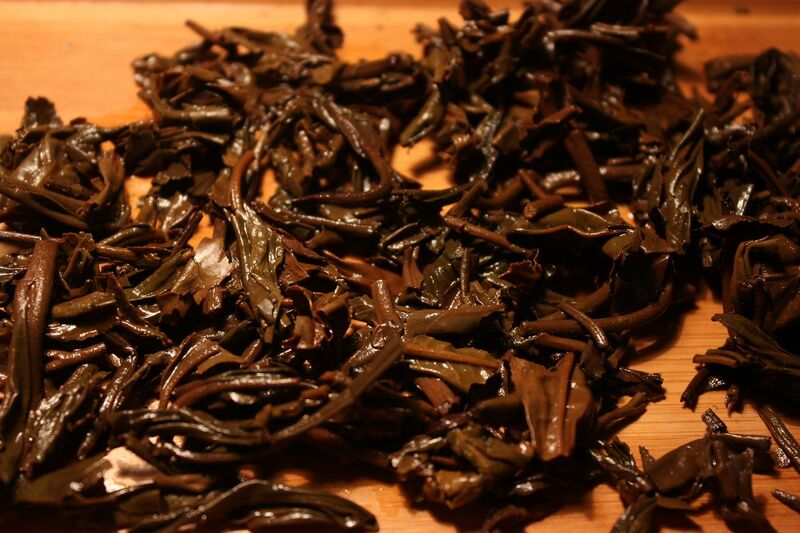 Lao Tongzhi is pretty much the base cake for the factory — the lowest tier mass market tea. I remember trying the very young version of this tea, and it tasted like any big factory, newly pressed cake — bitter, rough, but powerful in the hard hitting sort of way. The tea was not something you’d particularly enjoy drinking, but hope it will get better with time. An interesting thing to note about this tea is that it says “nongxiang xing” on the left — intense flavour type, literally. I have, however, never seen any other types of LTZ cakes, so I think this is all just silly marketing speak. 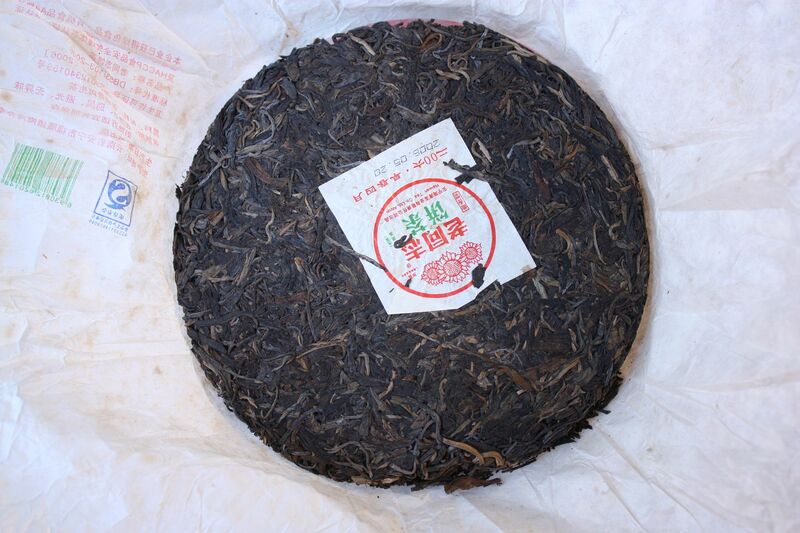 Since this cake is traditionally stored though, it’s not your run of the mill 2006 vintage young puerh. Right away, the smell is obvious when you open the wrapper. The cake also looks visibly darker. 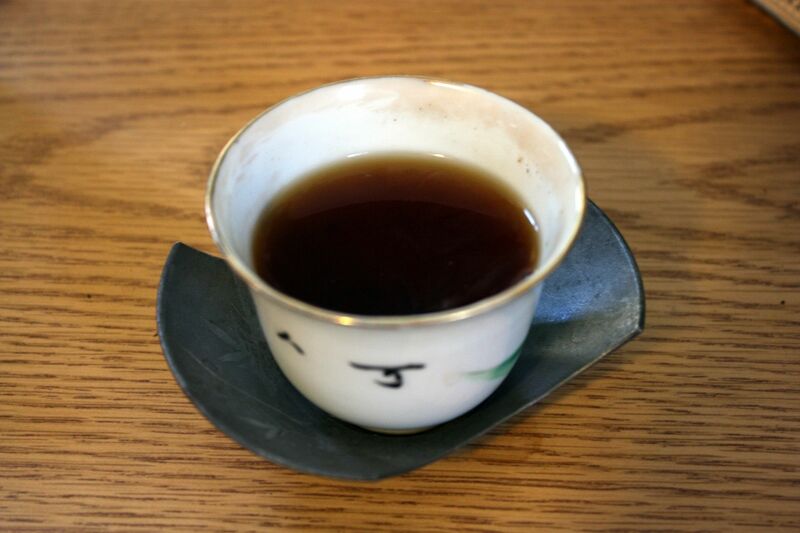 There’s a reason puerh is a heicha (black tea). There’s some white frosting on the cake, although nothing too serious. It’s not white all over, and once I crack it open, the interior is quite ok. Traditional storage can be overdone — as you sometimes see cakes that literally are covered in white hair. This is medium. The tea looks dark too, when you brew it. I believer it’s very important to educate yourself with stuff like this to get a sense of how a 5 years old, traditionally stored tea tastes like. If you don’t know what it’s like, then it is very easy for someone to come by and tell you that the tea is actually 15 years old, and you would not be able to tell the difference. In the cup, the tea is still a little sharp – the storage taste is quite present, and needs time to fade. The underlying bitterness still exists, although having aired it out for a week now since I got back, the tea is already somewhat sweeter. There’s decent body, nice aromatics that range from what Toki would call granny powder to dried leaves. Good, solid traditionally stored pu that needs some time to age. If I were to buy more of this, I’d just leave it around for a few years, and I think the tea will then progress to something quite nice. It is also necessary — after all, part of the process of storing a tea traditionally is to tuicang (退倉) process, to both reduce the immediate smell of the storage as well as further aging the cake. Stuff that just came out of the basement is not meant for consumption. The wet leaves are various shades of green and brown, a typical look for this sort of storage condition. Note how none of the leaves are black or stiff — they should retain flexibility, if they are well stored. All in all — a pretty enjoyable drink, I think. More importantly, this tea has gone from pretty undrinkable to pretty drinkable within a span of five years. I’m pretty sure that if you pick up a 2006 LTZ from Kunming, it’s still going to be fairly nasty. Very interesting, thank you. I wonder if this kind of traditionally stored cakes are available via popular channels or if you have to go there to find it. By popular channels, you mean online? I have yet to see reliable cakes online that sell this sort of thing. Some of the “aged” teas I’ve seen/tried that are supposedly much older sometimes make me wonder if they’re really just 5 year old teas, but it’s hard to say for sure and I don’t want to speculate. Yes, I meant online, if possible from trustworthy sources. I have only managed to taste once a 5 years old cake that was traditionally stored. I liked it, and I would have been interested to buy one to see how it would have evolved. But it was a one time thing. it is interesting to track a cake from being traditionally stored in the beginning and left to age to the remainder of the time to be drank vs having the cake dry stored from the beginning. when i visited hong kong last december, i was told that the first few years of pu erh is very important, and how long does it need to be in traditional storage before it comes out? i guess there is no fixed answer… my guess would be that this is more of an art that the hong kong dealers had master through time and they base it through the quality of the leaves? Yes, it does have to be judged based on the tea — not all puerh are suitable for traditional storage, and not all of them should spend the same amount of time in them. I think generally speaking it should be no longer than two years, maximum. Anything more and it turns into nasty cooked pu. In my experience slightly wet teas tend to age better in the short to medium run (we’re talking 5-10 years). Some will argue that in the long run dry stored teas will be better, but are you really willing to wait 30 years to see if that’s right? I’ve come back to this one article a few times, and in my inexperience felt rather confused by it. Is this sheng pu-erh, or shu? Why is it confusing? This is sheng, of course. Thank you for clarifying. Please excuse my trouble with the pictures, as my vision is somewhat limited due to colourblindness.